I would like to welcome you all to the California Thrifting Journal on Thrift Happy. This is where I welcome businesses to feature their resale shop. Congrats to our first featured store Whimsy, located in Carpinteria, California. What I loved about Whimsy store is not only do they have two stores, they also have a website and their very own blog. I think you will love reading about the happenings around Whimsy. 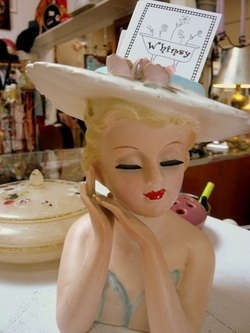 Here is little eye candy from Whimsy.... I hope you Enjoy!!! "Our shops are located in the charming seaside town of Carpinteria, California. This charming town is old fashioned, quaint and has wonderful antique stores, restaurants, unique shops, and a wonderful beach! Carpinteria is just a stones’s throw from Santa Barbara and a pleasant drive from Los Angeles." We would love to hear about your favorite store!